A man whose Yemeni wife successfully fought the Trump administration’s travel ban to reunite with their dying son in the United States says he’s angry that the policy kept the family apart. Ali Hassan told mourners before a funeral Saturday for his son Abdullah that the boy didn’t die in vain. He says he hoped their struggle will lead to a change in U.S. policy that will help other families reunite. Hassan is a U.S. citizen and brought his son to California for medical treatment for a genetic brain disorder. His wife spent more than a year fighting for a visa to come see the boy before he died. Abdullah Hassan was buried in the California Islamic Cemetery in Lodi after prayers at a nearby mosque. A boy whose Yemeni mother successfully fought the Trump administration’s travel ban to join him in the U.S. has been buried in California after a funeral. Abdullah Hassan had a genetic brain disorder and died Friday at an Oakland hospital, where he was on life support. His mother held him again after getting a visa and coming to California more than a week ago. The boy’s father, who’s a U.S. citizen, and others prayed Saturday at a funeral for Abdullah at a mosque in the farming town of Lodi. The casket covered by a white and green cloth was carried in, and the men in attendance could touch it before it was taken to a nearby cemetery and buried. Members of the Islamic community in central California are gathering at a mosque to mourn the death of a boy whose Yemeni mother fought the Trump administration travel ban to join him in the U.S. The funeral Saturday for 2-year-old Abdullah Hassan in the farming community of Lodi comes a day after he died at a children’s hospital following months of treatment for a degenerative brain condition. As part of Muslim tradition, a body must be buried within 72 hours of death. The child was expected to be laid to rest after the service. Abdullah’s mother, Shaima Swileh, fought for over a year for a travel ban waiver to see her son. An advocacy group successfully sued, and she got to the U.S. a little over a week before her son died. 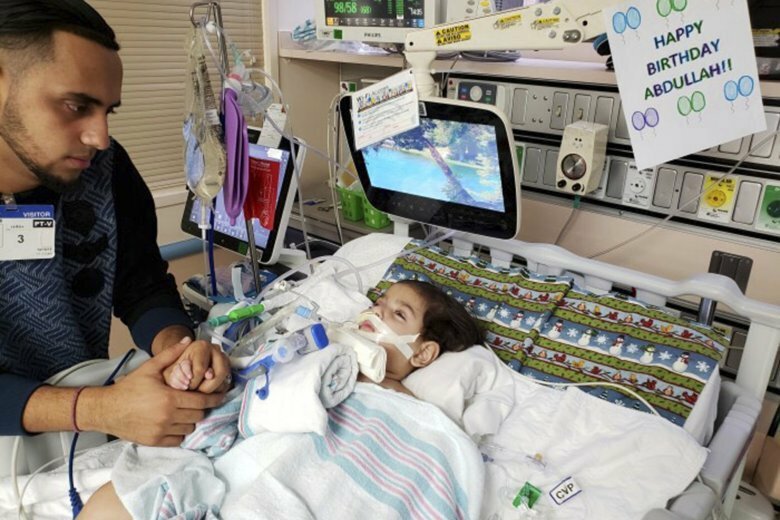 The 2-year-old son of a Yemeni woman who sued the Trump administration to let her into the country to be with the ailing boy has died. The boy’s father brought him to the United States for medical treatment in October. His mother Shaima Swileh remained behind in their Egypt home. The boy and his father are U.S. citizens but Swileh is not. Yemeni citizens are restricted from entering the United States under President Donald Trump’s travel ban. She applied for a waiver in 2017, but U.S. officials granted it only in December after the council sued.